This offseason, the other two California football teams will have many different decisions to make, but the most important one will be the same. Do we give our former #1 pick another year to become the franchise QB we need, or is it time to cut ties and move in a new direction? The 49ers and Raiders each had a number one draft pick within a three year span. They both took potential franchise quarterbacks, but neither has panned out to this point. Though there are plenty of pros and cons for both dilemmas, I think the answers are pretty simple. One is favorable and one is not. Let’s take a look at how both QBs got to the point they’re at, and the potential outcomes moving forward. 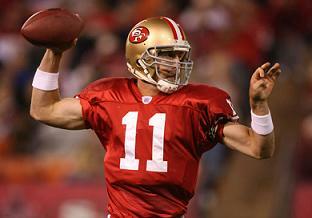 2005: The 49ers were coming off a 2-14 season and held the first overall pick. There was plenty of talent available, but SF’s biggest need was at Quarterback. The choice came down to Alex Smith or Aaron Rodgers. In the end, Smith was heralded as the better athlete, and more intelligent. Now, for every Ronnie Brown, Braylon Edwards, or Demarcus Ware they passed on, there was also a Cedric Benson, Pacman Jones, or Mike Williams that would’ve been worse. But, since Rodgers was the only other guy they were going to pick, he’s the only one it’s fair to compare with. To this point, Rodgers has thrown for more yards and touchdowns on less attempts than Smith, while throwing less interceptions as well. Smith got off to a rough start in his first year, throwing 1 TD pass to 11 interceptions. In 2006, he looked to be coming into form, completing 58% of his passes and connecting on 16 TD passes to 16 INTs. Last season was derailed by a shoulder injury, however, and when he came back this season, Shaun Hill had beat him out for the starting job. Smith, however, replaced Hill in Week 7, and had an up and down final 11 games to end the season. He finished with his best ever TD to INT ratio at 18:12. He also completed over 60% of his passes. The problem, though, is he still has yet to live up to his potential, and the 49ers are left to question whether he ever will. I can’t say with confidence that he will, but the chances are much better than his Oakland counterpart. Smith’s shoulder probably still caused him some discomfort early this season, but he should be back to full strength by now. The reason I see him getting better is his intelligence. While there certainly are exceptions based on physical gifts, the best QBs, like starting pitchers in baseball, are the smart ones who figure out the game and learn to play within it. I think Alex Smith can only get better the more he plays. 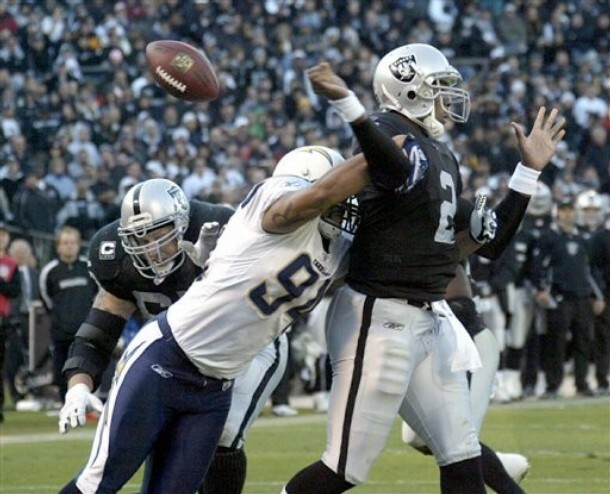 2007: The Raiders were coming off a 2-14 season of their own and held the first pick also. Also in need of a franchise QB, Al Davis couldn’t resist the size of LSU’s Jamarcus Russell, and despite new Head Coach, Lane Kiffin’s objections, selected him with the #1 overall pick. While I never really questioned the Niners’ selection of Alex Smith, I knew this one was doomed from the start. We all knew Russell could throw a ball across the Bay from his knees, but how does that translate to playing QB in the NFL? What he made up for in physical tools, he lacked in the mental department. Three seasons later, he has alienated himself from teammates and fans, something that’s hard to do in Oakland. The combination of bonehead plays, lack of accountability and complete lack of pocket presence has lead many to question his future as this team’s quarterback. He was given the keys to the franchise this year and repeatedly drove the wagon off a cliff, with an untimely interception, sack, or fumble. In his three year career, he’s completed just 52% of his passes for a lowly 65.2 QB rating. He’s also thrown just 18 TD passes to 23 INTs. Those numbers would all surely be lower if 90% of his passes weren’t dump off passes to backs. When he was replaced by Bruce Gradkowski this year, the rest of the team clearly elevated their level of play. It looked as if they felt they had a much better chance with anyone other than Russell out there. Now, whenever Russell gets into the game, it’s the result of an injury to another QB, and he is inevitably greeted with boos from the Raider Nation. Russell has shown no signs of getting better, and even worse, his drive and desire to get better have been called into question far too often. The Raiders need to make a decision, but if I know Al Davis, Tom Cable will be far more likely to be shown the door. My only hope is that the Raiders at least pick up a new QB who could challenge, and ultimately beat out Russell for the starting spot. The San Francisco 49ers were blessed with one of the easiest, no-brainer draft decisions when Wide Receiver Michael Crabtree fell in their laps at the 10th slot. Problem is, in Crabtree’s mind, it didn’t happen that way. He was the highest rated WR in the draft, so he should be paid like one. If you haven’t heard the story, here’s Niners Nation’s in-depth account. Michael Crabtree is continuing the much-maligned tradition of rookies holding out in training camp in attempt to earn more money despite the fact that they have never taken an NFL snap. I often wonder how fans ever forgive these players after pulling such shenanigans. The Oakland Raiders had to deal with this recently with Jamarcus Russell, and now, the nightmare has shifted across the Bay to Santa Clara / San Francisco where what the Niners once thought was a gift, has now turned into a disaster. While I’d like to root for the 49ers to hold a firm position, they don’t have much leverage here. Gaining much publicity this year in Niners camp is Alex Smith’s attempt to reclaim the starting spot that he should’ve been holding down for the last two full seasons. The concequence is a constant reminder of the franchise’s shortcomings in the draft which they held the #1 overall pick. It wasn’t considered by anyone to be a deep draft, but with #24 pick Aaron Rodgers succeeding Brett Favre in Green Bay, the scarlet and gold are publicly relegated to the short end of the stick. So, with the Alex Smith debacle playing in the background, the Michael Crabtree situation makes things that much more urgent. No one expects him to be a superstar, but at the same time, he’s as close to a sure-fire WR prospect as we’ve seen in the last few years. Adding to the burden is the lack of the depth at the wideout spot. Sure, there are a handful of capable receivers on the roster, but Brandon Jones, Isaac Bruce, and Josh Morgan doesn’t exactly have playoff receiving corps written on it. Crabtree, unfortunately, is needed. I will give that the 49ers fan base is a faithful one. The franchise has been driven into the ground over the course of the last decade by the York family, but the fan support has been unwavering. SF fans are dying to clutch on to a franchise player and cheer on his every move. The problem is, they can’t find anyone to fill that role. Alex Smith has blown his chances, Vernon Davis was practically handed the badge of fan-favorite, but has failed repeatedly to win over the faithful. Frank Gore and Patrick Willis have helped carry the torch, but for a fan base who has grown up with Jerry Rice and Terrell Owens, who didn’t start to wear on nerves until he had actually earned his stripes, Crabtree is in a unique position to be the man for years to come with one of the most storied NFL franchises. However, because the franchise is what it is, I don’t believe they should bend for Crabtree. Let him walk. This move on his part only is a preview of what is to come throughout his career. Though it may be a PR nightmare for the time being, time will ultimately prove it to be the right decision. Let’s face it, Crabtree isn’t worthy of lining up on the same hash mark as the great Jerry Rice. He belongs somewhere like Kansas City or Minnesota anyway. Anybody know the logistics of whether SF could work out a Crabtree for Boldin swap with the Cardinals?